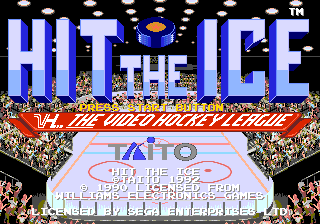 Hit the Ice is a 1990 arcade ice hockey game for Taito's B System arcade hardware by Williams Electronics Games. Aisystem Tokyo ported the game to the Sega Mega Drive in 1993, releasing it exclusively in the US. Hit the Ice is an arcade-style hockey game in which two teams of three players (two attackers and one goalie) compete against each other. Most of the rules of the original sport are dropped, meaning the aim of the game is simply to hit the hockey puck into the opposition's net by any means necessary. There are no licensed teams in Hit the Ice, just "Blues" and "Reds" (which in the Mega Drive version, is extended to eight different coloured teams). Punching opposition players during normal play is allowed. Arcade sports games of this nature (where rules are sacrificed for violence) were very popular in the late 1980s and early 1990s. The basketball equivalent may be considered to be Arch Rivals or NBA Jam. Main article: Hit the Ice/Magazine articles. NEC Retro has more information related to Hit the Ice.